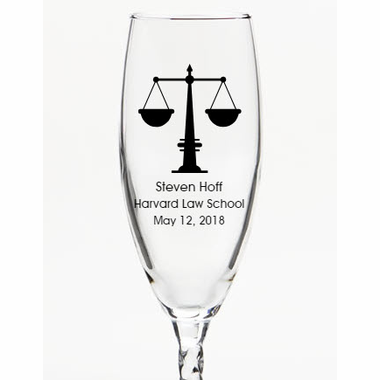 Law school graduation is an unforgettable day in every lawyer’s life, and customized glassware are charming party favors for your big graduation party to celebrate this success. 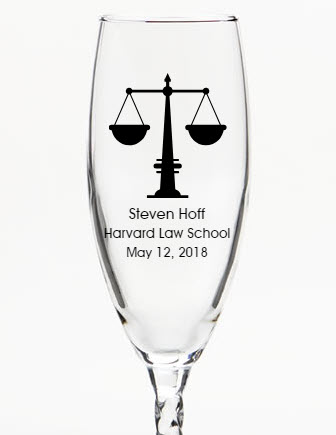 With symbolic lawyer scales imprinted on the surface, you can further add your graduation party details to complete this token of joy. Distribute it among your loved ones at the end of the day, and they will always appreciate the significance of this special day in your life. Each custom glass champagne flue measures 8.5" tall and 2.5" diameter with a capacity of 5.75 oz. It has a slender bowl and elegant twisted stem.